Before he left office President Obama passed the Workforce Investment and Opportunities Act; WIOA. 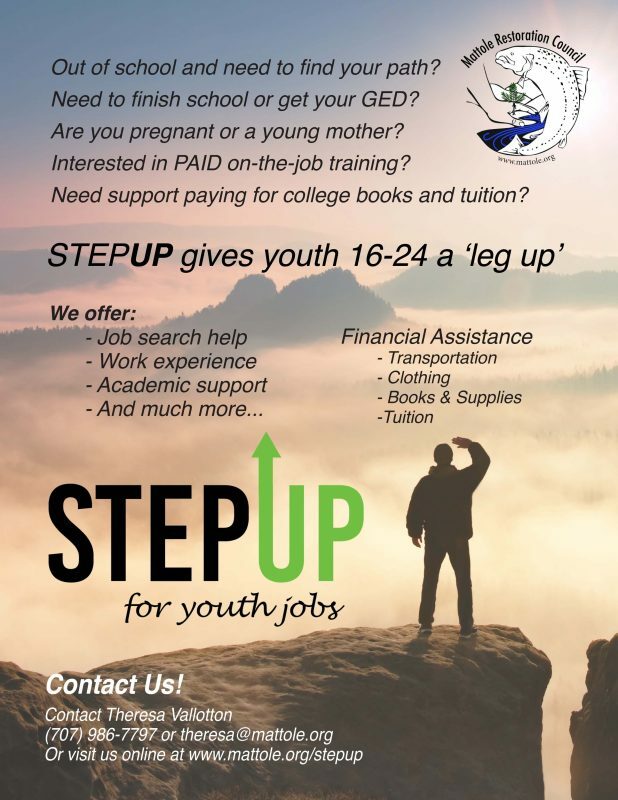 Funded through Calworks and known as STEP Up, this program awards grants to community organizations to help youth gain work experience or pursue an education towards increasing employability. Each participant is individually assessed and offered supportive services tailored to help them achieve their potential. Working with local schools, community organizations and businesses, our goal is to help our youth build their lives and fulfill personal goals. Both in-school and out of school youth, ages 14-24, qualify for this employment program. This program is especially suited to youth who are facing challenges, including: not enrolled in school; needs assistance with gaining basic skills; has a disability; is currently homeless; a runaway; an offender; in foster care or aged out; in out of home placement; an English language learner; pregnant or parenting; or low income. If you would like more information about this program, please contact Theresa at 707-986-7797 or theresa@mattole.org.